*The fabric is not faded but has some residue. 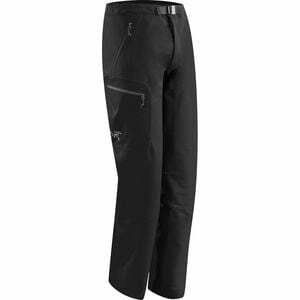 Whether you're trekking above treeline in late summer or climbing in the alpine during the fall, you'll want to be wearing the Arc'teryx Men's Gamma AR Softshell Pant. This three-season technical pant offers the stretch, abrasion-resistance, and weather protection you need for spring-through-fall alpine and climbing adventures. Being part of the AR family, the Gammas are designed to perform well in, and handle, all around conditions that you'll find up in the mountains. Burly Double Weave fabric is wind resistant while offering the breathability needed to stay cool and dry during intense ascents. The fabric is also highly abrasion-resistant to stand up to frequent brushes with rocks and bushes. A soft inner face offers a boost of warmth and is comfortable and soft against the skin. The stretch properties of the material won't hold you back as you high step to reach your next climbing hold. A trim fit and pocket placements comfortably accommodate climbing harnesses, and it even allows the pant to fit underneath a hardshell pant when conditions get harsh. These pockets also lay close to the body to prevent snagging and tears. The thigh pocket is laminated to offer more storage without seams to cause chafing. So you don't have to bring gaiters with you every time you go out, bootlace hooks at the adjustable cuffs keep snow and debris out of your shoes when you're walking up loose shale and scree to the base of your route.